Mr. Knueppel is retired and most recently was the non-executive Chairman of Harsco Corporation (a diversified, multinational provider of industrial services and engineered products), from 2012–2014. Prior to that role, he served as the Interim Chairman and Chief Executive Officer of Harsco Corporation in 2012. Mr. Knueppel is the former Chairman of the Board and Chief Executive Officer of Regal Beloit Corporation, from 2006–2011. He was elected as Chief Executive Officer of the Company in 2005. Prior to that role, he was the President and Chief Operating Officer of the Company from 2002–2005, and he was an Executive Vice President of the Company from 1987–2002. Mr. Knueppel has a B.A. in Economics from Ripon College and has an M.B.A. in Administration from the University of Wisconsin–Whitewater. 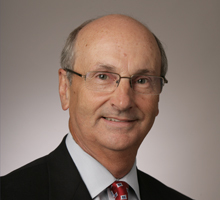 Mr. Knueppel serves as a director of Snap-on Incorporated and WEC Energy Group, Inc., and he previously served as a director of Harsco Corporation from 2008–2016. Mr. Knueppel has been a director of Regal since 1987.